The below pic of the Colt Canada L119A2 in use with UKSF at Exercise Winchester Accord was originally posted on the L119 Owners Club Facebook group in May 2016, by Jay Taranis; one of the well respected UKSF impression scene aficionados mentioned in the credits below. 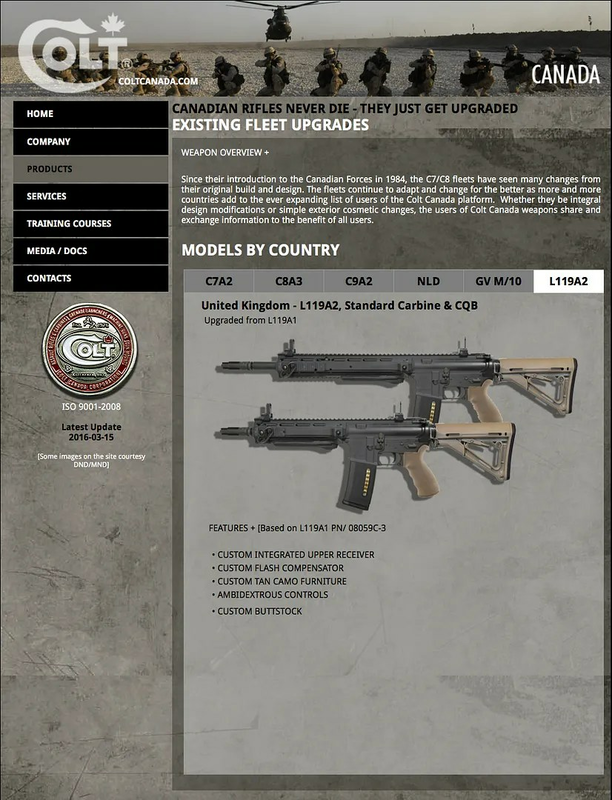 Underneath are legacy screenshots from Colt Canada’s website, which were used at the time to cross-reference with the Winchester Accord pic, in order to better understand the composition of the L119A2. Needless to say, additional information has come to light in the past few years. 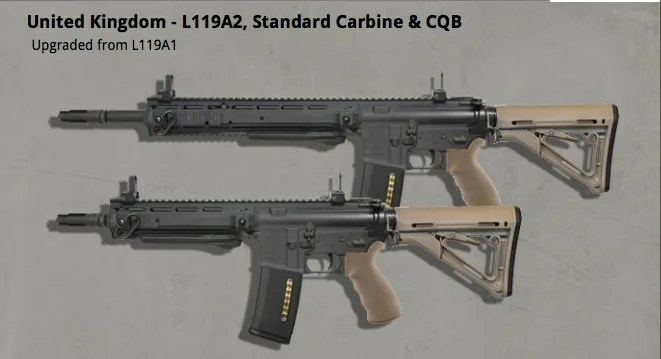 It’s been observed that there are two distinct variants of the L119A2. The L119A2 exhibits a monolithic upper, meaning that the rail and upper receiver are conjoined in one continuous unit. It is referred to as IUR – which means Integrated Upper Receiver. In 2016, I pointed out that LMT owns the patent on monolithic uppers and that they successfully prevented Mega Arms from marketing their own one-piece upper. It later became apparent that Colt Canada had officially licensed the monolithic upper receiver design from LMT, as evidenced by the US Patent number shown on the partial RIS ‘Alternative IUR’ L119A2. See the patent PDF here. The pic below shows a 2017 UKSF contract IUR, sold commercially by Colt Canada domestically. It is not known whether IURs delivered to UKSF since 2017 have exhibited the patent number. Earlier IURs did not and instead have their serial number displayed in this position. According to the table below, which was posted in the L119A2 Owners Group on Facebook, the string ending 98 corresponds with the 15.7” model. However, at this date I would be inclined to use the 98 number on a replica lower for either length upper. This is because, so far, I have only seen lowers with NSN markings ending 98 – regardless of upper. So just being cautious. The 99 lower may well be out there, or the NSN could have been created and never used. Only time will tell. Also note that 16” (as related above) is an approximation, not the defined length of the rifle length IUR’s barrel (which is 15.7″). There is no documentary evidence that I know of which suggests a different length for the SBR version of the IUR, so this is always taken to be 10″. 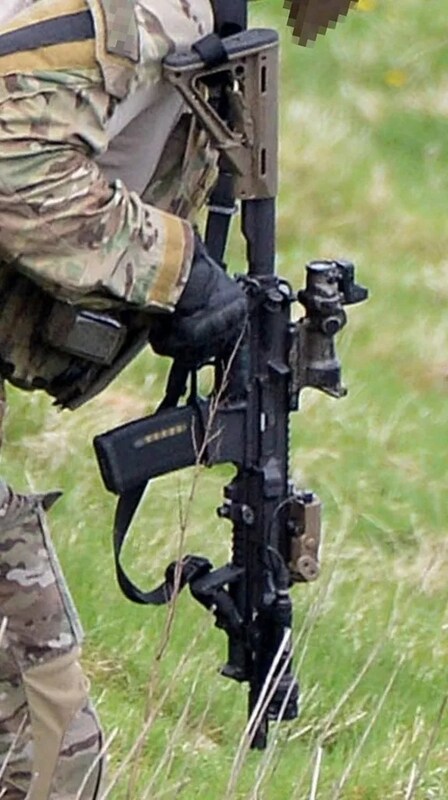 Gaz got in touch with some solid gold observed intel, about the extended latch charging handle. It turns out that in the wild a lot of UKSF charging handles have been swapped out for vanilla versions, because the extended latch catches on gear. Others have had the latches replaced or cut down and in one case, a BCM charging handle has been identified. Since May 2016 when this article was originally published, I’ve done my best to keep it refreshed with L119A2 updates. I’ve learned about these through my own research and from people in the know (some of whom have legit contacts). However, in its original format and with a raft of assumptions it was beginning to creak. So, in August 2018 I decided to restructure it. New info and pics are added when available. Big thanks to Jay Taranis for his help at every stage of this article’s evolution, and to Gaz_isg, E27R, HRW and perr_mike for their support and clarification. Some other contributors need to remain anonymous, but I’m no less grateful to them for their intel and clarification.